I have been using the following workout setup for months now and I reaaaaallly love it. 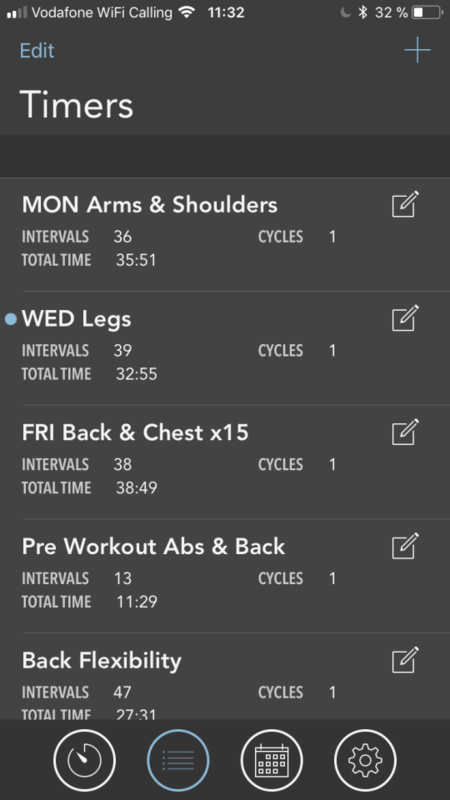 I use a mobile/watch app I fully customised to work out as efficiently as possible. Read further on how I combine working out with learning. I work a lot, at the table, which isn’t great to start with. Therefore, I desperately need to work out frequently as it balances out a set of detrimental side effects such as blood pressure, high blood sugar, excess body fat around the waist and abnormal cholesterol levels. I do not fall victim to those side effect luckily, but my mother does to a certain extend, unfortunately. I can see these effects at work. Not great. All my live, I have been pretty active but working a lot (and then at a desk) is very counter productive to ones health. No surprise of course. When I say workout, I do not primarily mean lifting weights. In fact, lifting weights is not sufficient for me, it is not even the best thing to do as it shortens muscles (as sitting too much does). The best workouts for me are calisthenic, body-weight exercises and interval training next to intense stretching. You may laugh, but I am so inflexible which is in part due to sitting at a desk for long hours. As I do quite a bunch of routines per week, I want to do them as smoothly and efficiently as possible. 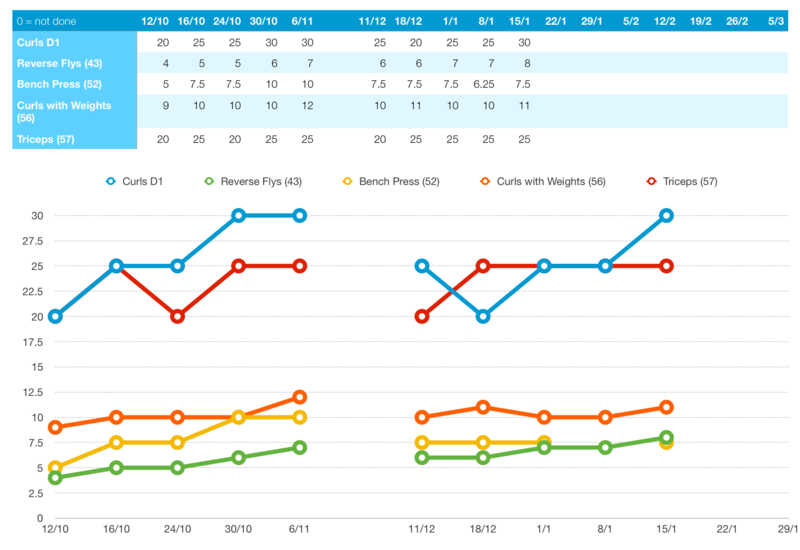 Over the years I have done a handful of routines that I put together myself based on detailed research and an understanding of what’s best for my body. My current workout routines are based on a couple of 10-year old books (both in German). The first book stresses the importance of proper posture and lays out an exercise plan to fix it. The other goes into detail of a range of exercises that are shown in the first book. I LOVE planks in any variation. Side note: A colleague of mine (a Crossfit nerd) once did a routine which was organised by local fitness startup. A warm up exercise were planks. If you would fall down, you would need to crawl 10m back and forth and plank again. Interestingly, this colleague fall down after 40-50s (as most people did) whereby I kept planking for the entire timeframe of that exercise. So much for the core strength of Crossfit nerds (granted this is hardly representative). Looks like a lot, right? It is, especially on the part of stretching and rehab training. The rehab routines are primarily to strengthen my shoulder belts as I have had/still have a shoulder impingement and pinched nerve in the same shoulder. I do not track the core or rehab exercises in Numbers, though. I have started with exercising my core regularly about 5 years ago. I found the videos of Sean Vigue suitable to my needs and stuck with it. My favourite plank workout is this: Death By Plank. I use Apple Numbers on the phone as A. the screen is big enough B. I have yet to find a simple app and C. can see progress on a graph. As you can see, I have started with these workouts in early October 2017. In between I have been either sick or travelling (without access to a gym). The goal: Work out as efficiently as possible and learn along the way as much as possible. I have tested all interval apps that were available in the App Store as of October 2017. I have chosen this Intervals app because of its functionality, the Apple Watch app, the interaction design as well as its visual design. 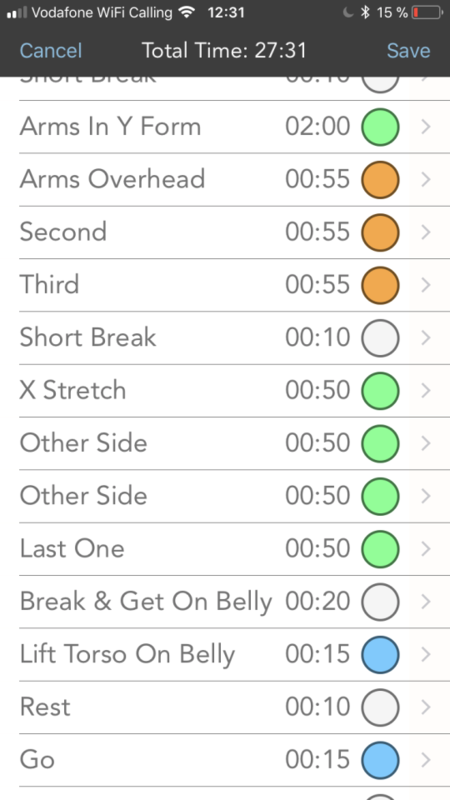 If not Intervals, you may want to check out Seconds. There is one feature that is the most brilliant. Read on. The beauty of an intervals app is its simplicity. But I had to “hack” how it works in order to reap the biggest benefits. Typically, you would add an exercise (say planks) and its duration, a break/rest and duration in between and the number of interval sets (and perhaps the number of cycles). Break intervals and durations are usually set equally across all exercises. Alas, this does not work for exercises that are not repeated. The “hacked” exercise structure is one where I do not use the preconfigured rest intervals. All exercises and breaks are simply set one after each other, breaks included, in any given workout. In order to keep things organised I give each set of exercise a specific color, and rests/breaks set to grey (seen on the right on the above screenshot). The above is one set. Right after, I have set a break called “Short Break”, and then again a set of exercises, here “X Stretch”, and so on and so forth. The feature I love most is that the app reads out each upcoming exercise or break over my headset. Hence, all my workouts (weights, stretching or interval trainings) are fully customised, that is, each exercise and break is written out. Intervals will then read out loud each and every exercise and break, even before it begins (you can set a timer for that too). You can instruct Intervals to either do this through the phone (e.g. headset) and even the watch. 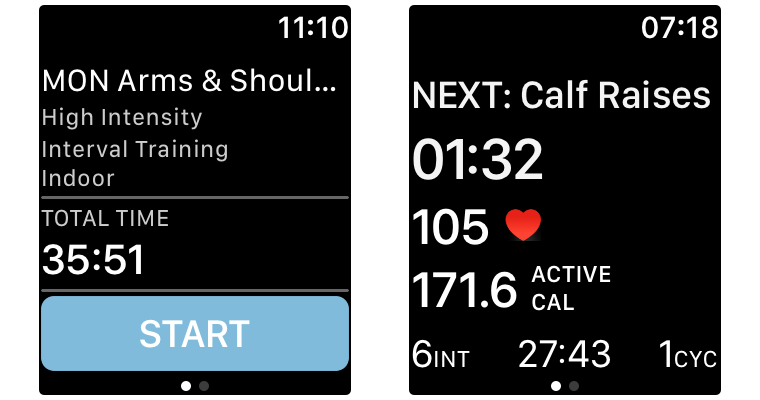 Further, the watch vibrates just before any change in exercise or break (you can set differently timers for that, I have set it to 5s). You may say that you need repetitions. Well, does the body or a certain muscle care about numbers? No, it cares about the timeframe over which it is exercised or trained. Fundamentally, a timer set to 45s is the same thing as set of repetitions of, say, 10 (depending on exercise). I oftentimes see people in the gym rushing to finish a set of repetitions in no time instead of giving it the required duration it needs. That is not a productive and healthy way of exercising. For some exercises, though, it may be beneficial to move as fast as possible. However, this is not important for us here. The huge benefit of such timer-based routines is that you can compare each execution of an exercise with another. You will get immediate feedback on whether it was too fast, or too slow. Further, you will be able to figure whether breaks might be too long or too short. 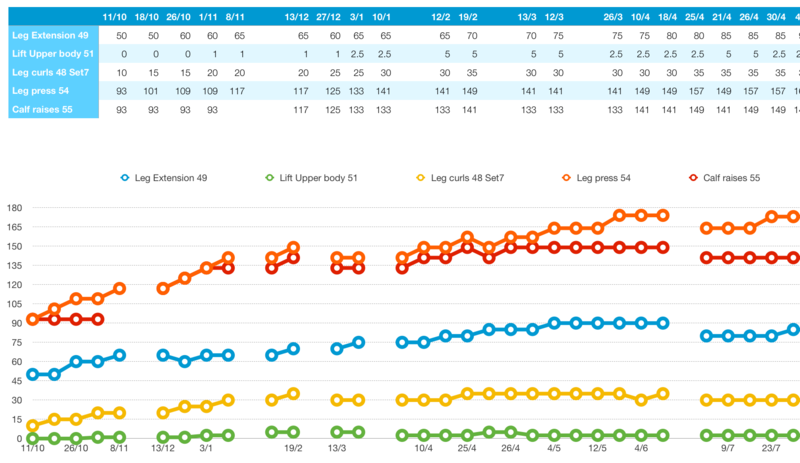 ￼In regard to Intervals, the huge advantage of having the app speak out to you, is of course that you can solely focus on your workout routine. You can work out hands-free from start to finish. Albeit you have to kick off the workout by tapping Start. And almost best of all, I have an Scribd / Audible account through which I listen to audio books, like Ray Dalio’s Principles, The Intelligent Investor or The China Study. Intervals actually reduces the volume to about 50% so that you can hear her speaking to you about what comes next.